l-r: Sarah Thornblade, Ambroise Aubrun, Cécilia Tsan, Andrew Duckles. 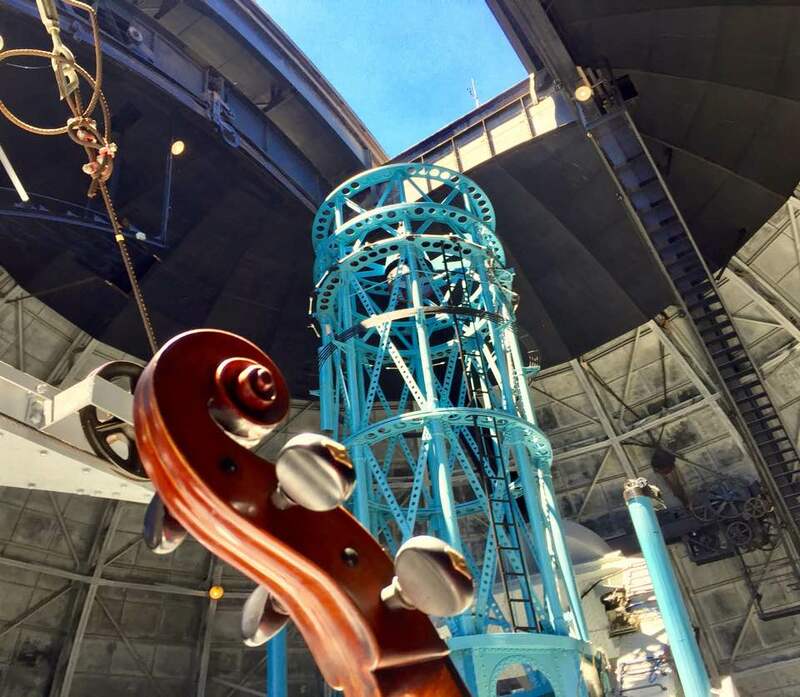 The last of this year’s Sunday afternoon concerts in the 100-inch telescope dome at Mount Wilson Observatory comprised two chamber masterpieces: one latish Schubert, the String Quartet No. 13 in A minor, Op. 29 D.804 from 1824, and one earlyish Debussy, his sole String Quartet in G minor Op. 10 L.91, completed in 1893 (at the same age at which Schubert died). The performers were Ambroise Aubrun and Sarah Thornblade, violins; Andrew Duckles, viola; and Cécilia Tsan, ‘cello, who has also been the artistic mastermind behind both last year’s and this year’s series. 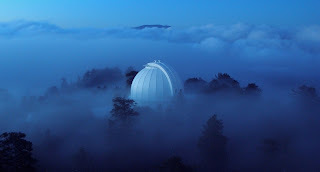 Mist enshrouding the 100-inch telescope dome. Waiting for the doors to open for admittance, the abrupt chill cast by the thick drifting banks of mountain mist that kept obscuring the October sun struck me as a not altogether fanciful metaphor for the major/minor oscillations that constantly occur in Schubert’s later music, where warmth and optimism are suddenly shadowed as if by doubt. 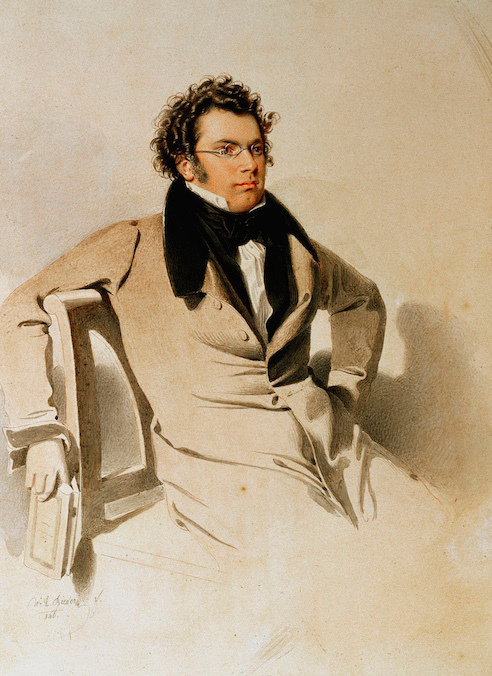 Schubert’s String Quartet No. 13 is so prevailingly somber, however, that the opposite might be said to be the case. Apart from the Allegro moderato finale which is decisively in A major, for the remainder of the work the major-key shifts form passing lightenings of the overall gloom. This is particularly so in the long first movement whose foreboding opening—a bleak ostinato on second violin against a juddering rhythm from viola and ‘cello, above which a long-breathed and haunting melody is unspooled downwards by the first violin—casts a long shadow over the remainder of the work. The external chill permeated into the dome to the extent that it reached the performers’ fingers, which had audible difficulty in articulating this opening clearly. But by the end of the long first movement exposition (which sadly was not repeated, doubtless due to time constraints), their playing had arrived and remained at a model blend of clarity, insight and passion. 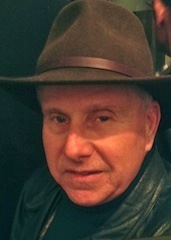 The bitter exultancy that climaxes the first movement development rang around the steel interior, which must have an acoustic decay time of several seconds, like a colossal distant bell being struck. Most listeners in any regularly shaped auditorium are seated some distance from the players, and if the building, be it cathedral or hall, has that much resonance then the music can be fatally drowned in enveloping echoes. 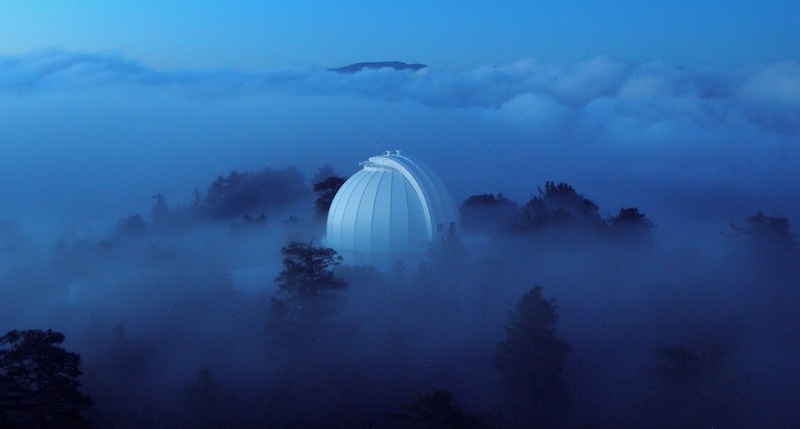 In the Mount Wilson dome, however, simple proximity makes this extreme resonance not just bearable but positively thrilling for the audience. The doughnut shape of the viewing platform where the concerts are held (the telescope itself projecting up through the whole in the center) necessitates audience and players being grouped together on one side. Even at the tips of the resulting crescent moon-shaped seating layout, there are only four rows of seats, while most listeners are in the center in just two rows. The players are thus extremely close, but the music is saved from oppressiveness and enhanced by the aural halo bouncing back from the surrounding metal interior. It is a unique sound, in my experience, and must be heard to be believed. Schubert’s String Quartet No. 13 is commonly nicknamed “Rosamunde”, because the main theme of the second movement is borrowed from the Act 3 Entr’acte in that incidental music, composed the previous year. Interestingly, after identical (apart from instrumentation) statements of that theme, the music in each diverges sharply, with the quartet version maintaining a far more purposeful tread than the dreamy musings of the Entr’acte. 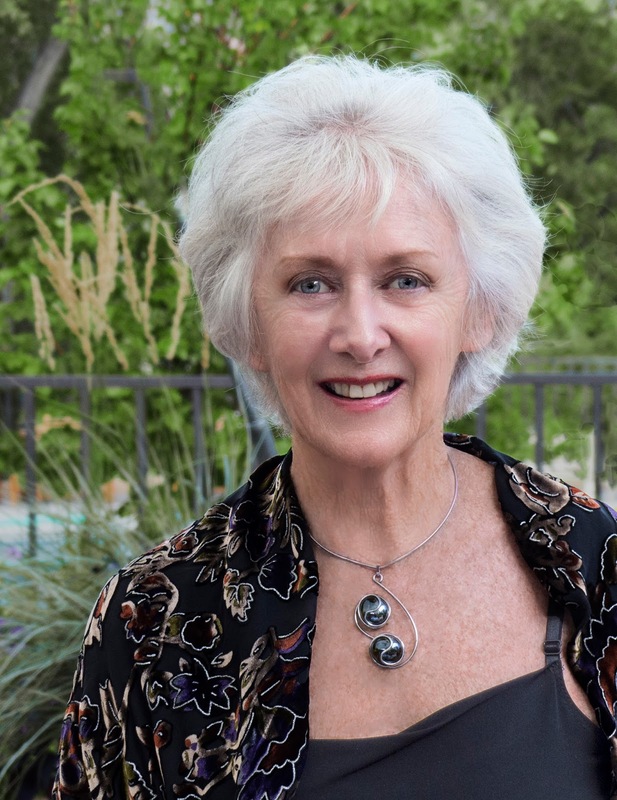 Then before the finale, there is one of the least joyous Menuettos in all music, led off and permeated throughout by a long-held low ‘cello note that in this measured performance was intoned by Ms. Tsan’s instrument with an almost Norn-like sense of foreboding and solemnity. 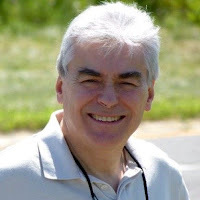 The finale does at last maintain a relatively positive momentum, though this account seemed to underline those Schubertian major/minor shifts, signaling that all is never going to be well for very long. Debussy playing the piano at the home of the Chausson family, 1893. Debussy’s String Quartet predates his other three major chamber works by over 20 years, and stands at a crossroads between the classically influenced styles of Franck and Fauré and his own imminent breaking free from harmonic and structural constraints. 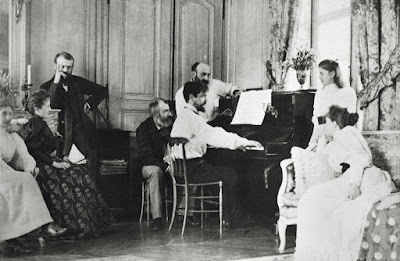 Its Animé et très décidé first movement in this performance was powerful indeed, with Debussy’s muscular, close-packed harmonies energetically projected and climaxed with double-stopped ff chords from all four players of almost shocking impact. The second movement, marked Assez vif et bien rythmé and a scherzo in all but name, is in the greatest possible textural contrast to the first, with teeming pizzicati that in this account went pinging around the dome like audible fireflies. Following the traditional four-movement layout, but eschewing tradition in much else, the slow third movement was marked by some truly other-worldly muted pianissimo playing towards its close by Ms. Thornblade, who had swopped the first and second violin roles with M. Aubrun between the two works. After a slow introduction that includes some of the most chromatic writing in the whole piece, the main body of the finale returns to the close-packed tension of the first movement, and only in its last few pages achieves a sense of struggle exuberantly overcome. Such was the energy generated here that it seemed even to have warmed the air in the dome! 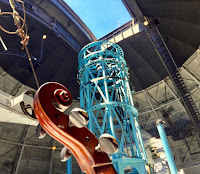 In his introduction before the musicians came on to perform, Mount Wilson Observatory Trustee Dan Kohne commented on how these concerts in this place embrace and combine the best that humans can achieve, the quest for knowledge and the profundity of great art. Never a truer word… and long may both continue on this particular mountaintop. Previous concerts at Mount Wilson were reviewed here, here, here, and here. 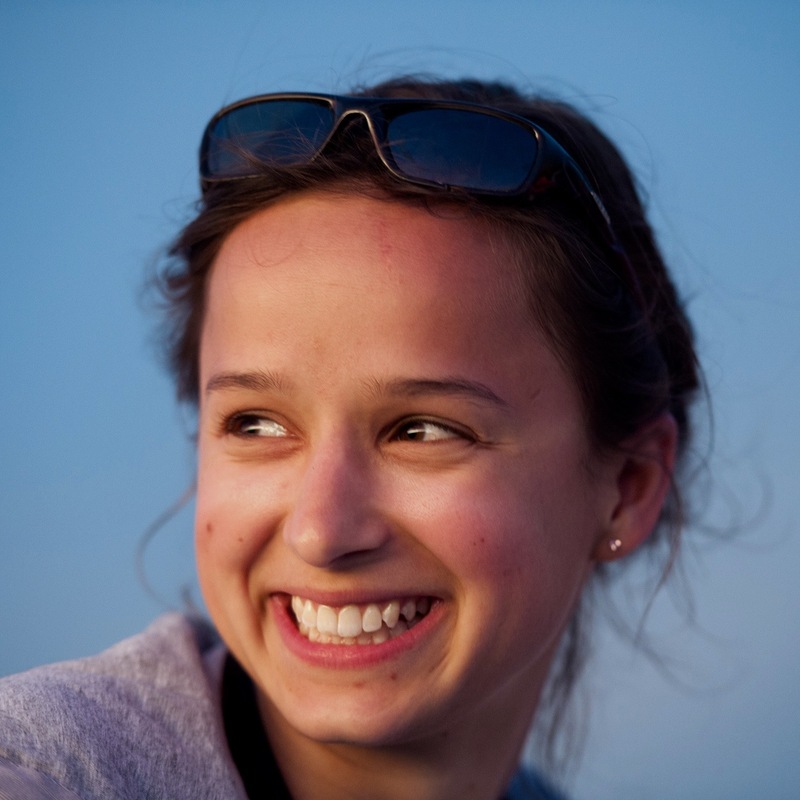 Photos: The performers: the author; Mount Wilson: Courtesy Mount Wilson Observatory; Schubert: Pinterest; Debussy: DEA/G. Dagli Orti/De Agostini/Getty Images; Cello: Cécilia Tsan.